The Eucharist, in the Mass and outside of the Mass, is the Body and Blood of Jesus Christ, and is therefore deserving of the worship that is given to the living God, and to Him alone. "I pray ... that Christ may dwell in your hearts through faith, as you are being rooted and grounded in love. I pray that you may have the power to comprehend, with all the saints, what is the breadth and length and height and depth, and to know the love of Christ that surpasses knowledge, so that you may be filled with all the fullness of God." So how do we come to know Christ and all his vast love for us? Does it just appear in our hearts one day or do we have to search for it? 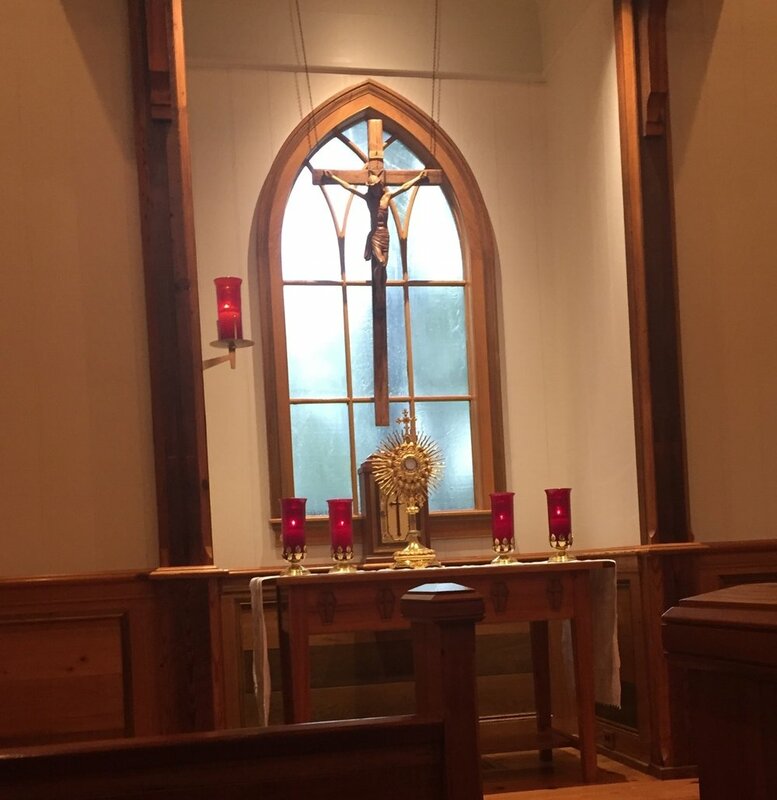 For some it comes through the quiet moments of Eucharistic Adoration, during which in the real presence of Christ in the form of the Blessed Sacrament we can sit quietly and hear his voice. We can stay for 5 minutes or 5 hours. We can pray or simply meditate. Most importantly we need an open heart to hear his individual message to each of us. Eucharistic Adoration, an ancient, prayerful devotion, is the coming in prayer before the Real Presence of God found in the exposed Blessed Sacrament. The Blessed Sacrament is exposed in a monstrance so that the Host is clearly visible to all who come to pray. Lit candles around the monstrance remind us that Jesus is the Light of the World. Unlike at the garden someone must be present and awake to guard Christ. "This is indeed the will of my Father, that all who see the Son and believe in him may have eternal life; and I will raise them up on the last day." The practice of adoration dates back to the beginning of Christianity, when monastic hermits would reserve the Eucharist for weekly self-communication over long periods of time. By praying in their individual cells in the presence of the Blessed Sacrament, they would be venerating the body, blood, soul and divinity of our Lord Jesus Christ, also known as participating in Eucharistic Adoration. 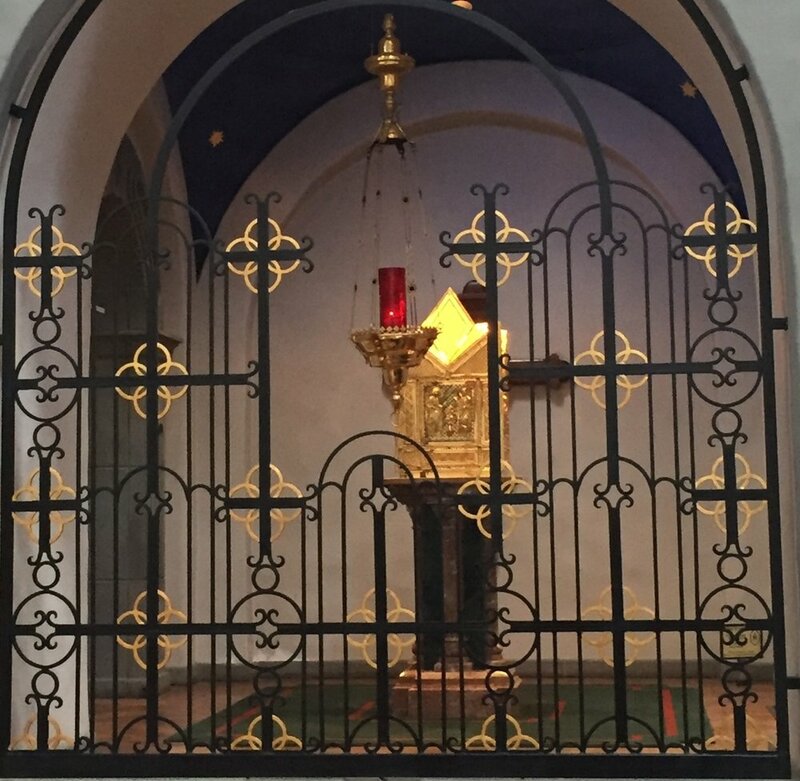 As monasticism became more communal, the reserved Eucharist was moved to a special vessel called a tabernacle that was placed in a separate room near the sanctuary available to the whole community. Eventually the tabernacle was moved to the main church and placed near the altar. Pope St. Gregory VII encouraged both religious and lay persons to engage in private adoration of Christ in the tabernacle. A red light is visible when consecrated hosts are in the tabernacle, indicating the Real Presence of Christ. Whenever we pray before and after mass or confession, we are considered in private adoration. In 1262 Pope Urban IV instituted the Feast of Corpus Christi to honor the mystery of the perpetual presence of our Lord Jesus Christ’s Body, Blood, Soul, and Divinity in the Blessed Sacrament outside of the Mass. Eventually, a procession of the Blessed Sacrament in the monstrance became part of the feast such that a bishop or priest carries the monstrance and the laity and clergy follow him on a route through the parish streets returning to the church for a Benediction. These processions continue today, when we can literally walk with Jesus through our streets. Early in the Middle Ages, forty hour prayer vigils began being celebrated during the Triduum. Forty hours signifies the amount of time that Jesus lay in the tomb before his resurrection. 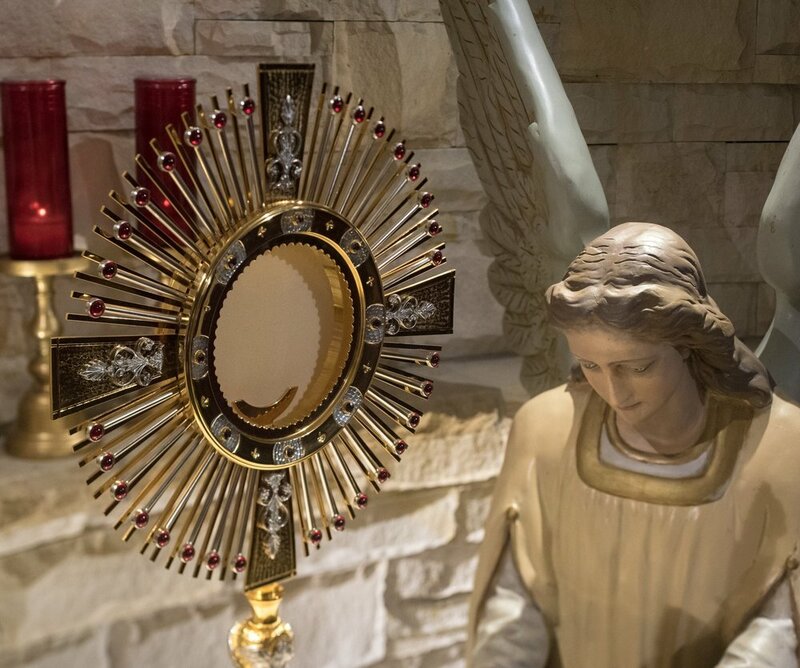 Eventually, the forty-hour devotion began to be celebrated throughout the year and included taking the Blessed Sacrament from the tabernacle and placing it in a monstrance on the altar for adoration. At the completion of the forty-hours, the Blessed Sacrament would be moved to another church and so on. St. John Neumann introduced the Forty-Hours Devotion to America in 1853. This devotion is considered the precursor to the organized Eucharistic Adoration we have today. Another important aspect of Eucharistic Adoration is called the Holy Hour, in which an hour is spent in formal or informal worship in front of the Eucharist. In private revelations between 1673 and 1674, St. Margaret Mary Alacoque was told by Jesus that he desired her to spend one hour a week on Thursday nights at 11 o’clock and pray with him representing the lost hour in which the Apostles had slept. Since this was a private revelation, it did not gain influence in the church until much later when several Popes approved the revelation. Eventually, the practice spread and in 1886 Pope Leo XIII allowed Holy Hours to be practiced any day and hour of the week. Public adoration with the Blessed Sacrament exposed in the monstrance on the main altar of a chapel or church for a specified time. This usually includes a formal beginning and ending to the adoration. 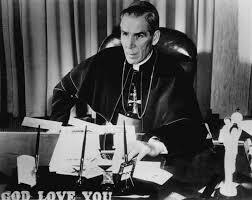 Special holy day adoration or adoration for a special intention in the church. Weekly or monthly adoration at your parish that occurs on a regularly scheduled day for set hours, usually from morning to evening. This generally concludes with a formal holy hour. The traditional Forty Hours Adoration following the Good Friday service. Perpetual adoration that continues for 24 hours a day, 7 days a week all year long in a designated adoration chapel. 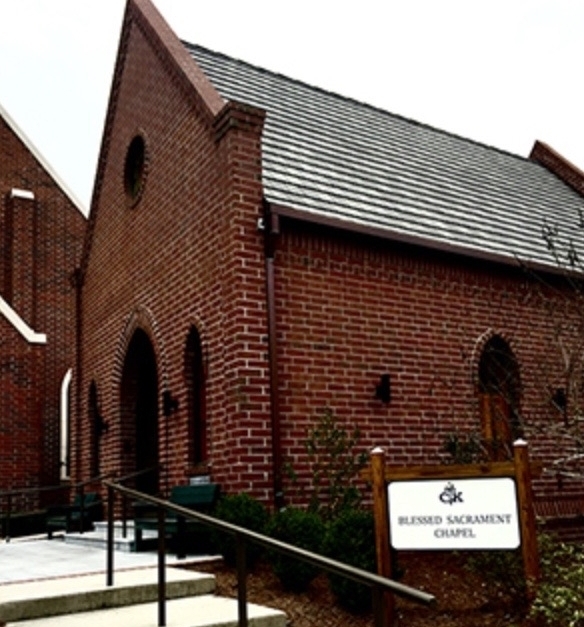 This requires the commitment of approximately 400 parishioners on a weekly basis if at least two are present and someone is a back-up in case of emergency. This is a great blessing to a committed parish community because it gives its faithful unlimited access to the Blessed Sacrament. A list of perpetual adoration chapels organized by state can be found here. 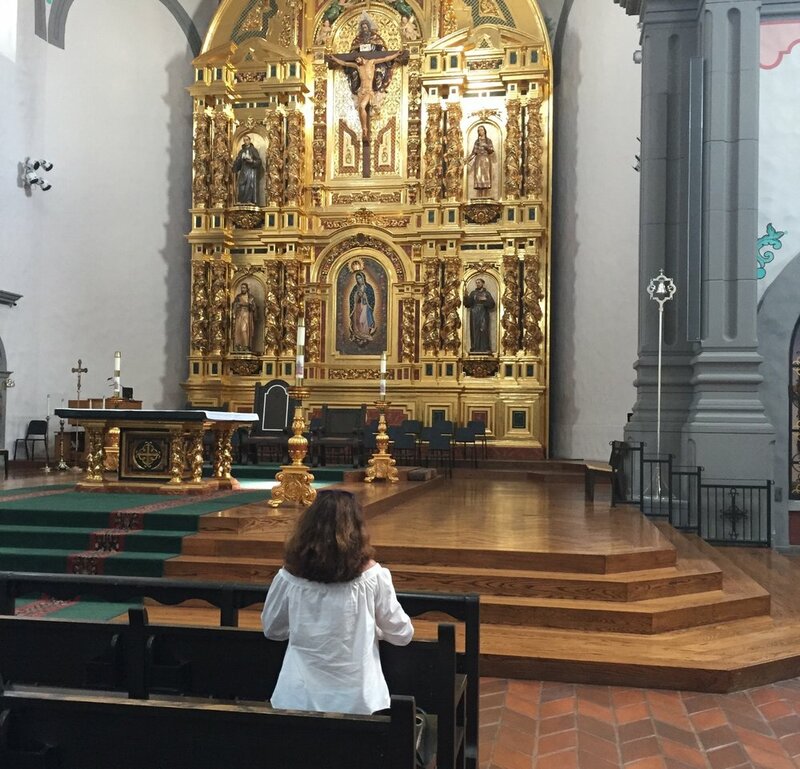 This site is also a great resource for those considering starting an adoration chapel. The great monstrance of the Cathedral of Toledo is more than twelve feet high and adorned with 260 statuettes. It is one of the largest in the world and its construction took more than 100 years. It is said to be made of the gold brought from the New World by Christopher Columbus.